It was a rough week for Indiana. The state got battered by a big winter storm on Saturday, making driving tough for the IU-Purdue game on Saturday. But for the Hoosiers, the week was even worse than the storm. Indiana dropped two games it really needed to win against Nebraska and Purdue, and the wheels seem to be falling off a once-promising season. In the span of three weeks, Indiana went from one of the top teams in the Big Ten to a team that is trying to regain its identity and adapt to conference play. The week ahead will be important for the Hoosiers to get back on their feet and stop the slide, as IU takes on Northwestern and Michigan. But for now, here’s a closer look at the last week in Indiana basketball. In a game that felt like a must-win for the Hoosiers in a lot of ways, Indiana was outplayed once again. Romeo Langford got in early foul trouble and was simply a non-factor in the game. It was his worst game as a Hoosier: four points on a 2-for-10 line. Purdue stacked the box defensively and essentially dared Indiana to shoot from outside, and it worked. On the other end, Carsen Edwards put up 20 points, but by his standards that was a quiet game. Purdue was really powered by solid performances from its role players such as Nojel Eastern, Matt Haarms, and Trevion Williams. I wrote about Purdue’s defensive strategy and how it exposed the Hoosiers, as well as Romeo Langford’s struggles, in my notebook for Inside the Hall. 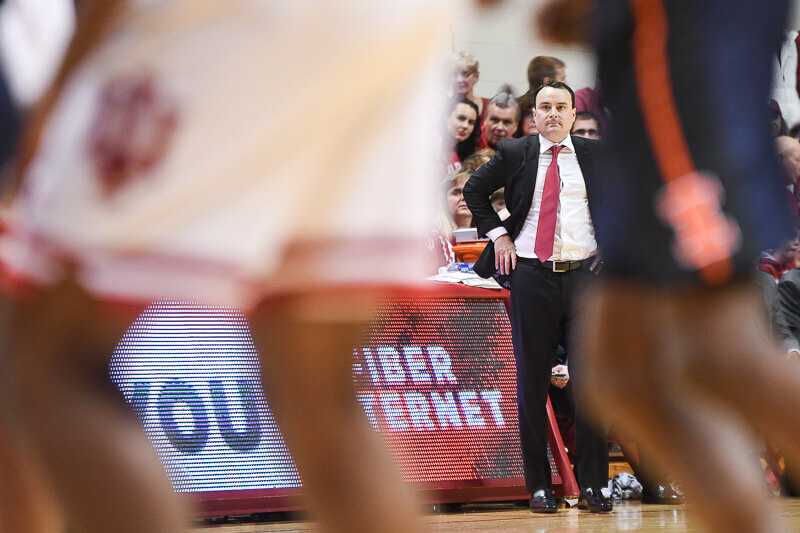 In the Assembly Call Postgame Show, Jerod, Andy and Ryan discussed Langford’s tough game, Justin Smith’s solid outing, and the underlying issues with IU. With 14:36 remaining in the game and down 46-34, IU was in danger of being left in the dust for what would become its fourth-straight defeat. Freshman guard Romeo Langford was left open for a three-pointer in front of IU’s bench. Langford rose into the air with his typical smooth shooting motion, but the ball’s trajectory barely eclipsed the rim as it made contact with the side of the net. Just 14 seconds later, Purdue junior guard Carsen Edwards had received the ball from senior forward Grady Eifert, and proceeded to size up Langford, make a three-pointer over his head and calmly backpedal across the the large “P” emblazoned on Keady Court. No passage of play from Purdue’s convincing 15-point win, its fourth in five games, better exemplified the performances from each team’s star guard. Earlier in the week, coming off two straight road losses, Indiana needed a win at home against a solid Nebraska team to get things back on track. Instead, the Hoosiers came out flat from the opening tip and lost 66-51 in a game that was never really that close. IU did cut the deficit to as little as three at one point, but whenever the Hoosiers started to make a run the Cornhuskers would one-up them. Romeo Langford and Juwan Morgan had solid games, but IU’s supporting cast failed to adequately, well, support them. Defensively, Indiana struggled against the likes of James Palmer Jr. (11 points, nine rebounds, seven assists) and Glynn Watson Jr. (15 points, five rebounds). The Hoosiers did a decent enough job of limiting the high-powered Nebraska offense, but IU’s offense wasn’t good enough to support it. In Ryan Corazza’s film session at Inside the Hall, he broke down why Indiana struggled so much against Nebraska’s 1-3-1 zone. Murphy Wheeler of the Indiana Daily Student wrote that IU was simply outplayed in every facet of the game. In this week’s episode of Podcast on the Brink, Alex and Jerod were joined by Dustin Dopirak of The Athletic to discuss Indiana’s recent woes. They talk about a wide range of topics, including why the Nebraska game altered the track of IU’s season, what long-term concerns they have, and much more. On the advice of coaching friends who’d lost their jobs at one time or another, he took a year off to work as an analyst for CBS Sports, attend practices and decide whether he wanted to get back in the profession. He decided that he had to get back in — even if it meant leaving his beloved Philly. Even if it meant working for someone for the first time since he was 31. Even if that someone was young enough for Flint to have recruited him out of high school. That’s why he agreed to join the staff at Indiana when Miller took over following the firing of Tom Crean. The move took Flint away from the East Coast for the first time in his career, but he was in a Power 5 conference and with a blue-blood program for the first time as well. At Indiana, there is more fan interest, better facilities, more resources, more tradition and better access to high-level players than anywhere he’d previously worked. The Big Ten has established itself as the top conference in college basketball this season, and it was another solid week for the conference. Eight Big Ten teams are ranked in the top 50 of KenPom (No. 3 Michigan State, No. 6 Michigan, No. 9 Purdue, No. 13 Nebraska, No. 16 Wisconsin, No. 17 Maryland, No. 32 Iowa, No. 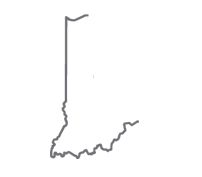 35 Indiana, No. 36 Ohio State). The biggest win of the week unquestionably belongs to Wisconsin. The Badgers handed first-place Michigan its first loss of the season in Madison on Saturday. But if Wisconsin had the biggest win of the week, Maryland had the biggest overall week. The Terrapins have been surging and picked up two impressive wins over Wisconsin at home and at Ohio State. Michigan State continued to play well with wins over Nebraska and Penn State. There are several other enticing matchups in the upcoming week. The biggest game is on Monday when Maryland plays at Michigan State. On Wednesday, Ohio State hosts Purdue. Michigan State visits Iowa on Thursday, and Friday brings a Michigan-Indiana rematch. Today marks seven weeks until Selection Sunday, and IU is looking to make the NCAA tournament for the first time in the Archie Miller era and the first time since 2016. While Indiana has been on a slide recently, the Hoosiers still project as a tournament team. Here’s a look at where various Bracketologists have IU pegged for the Big Dance. You can keep up with our own Andy Bottoms’ projections every week at insidethehall.com. Note: these projections were published before Indiana’s loss to Purdue, but even with that loss the Hoosiers still project (at least for now) as a Tournament team. Thomas Bryant enjoyed a solid week in two games with the Wizards. In a tight loss to the Raptors on Sunday, Bryant put up 18 points and 11 rebounds for his second career double-double. But the more exciting play of his week came in Thursday’s NBA London game against the Knicks. Bryant scored the winning basket, his 10th point of the game, on a goaltending call. In that London game, Noah Vonleh had a double-double with 13 points and 10 rebounds. Victor Oladipo had a quieter week. His Pacers went 2-1, beating the Suns and the Mavericks and losing to the Sixers. He averaged 11.67 points, six assists and 5.33 rebounds per game over that stretch. OG Anunoby played in the Raptors’ win over the Wizards, but he missed the team’s next two games for personal reasons.